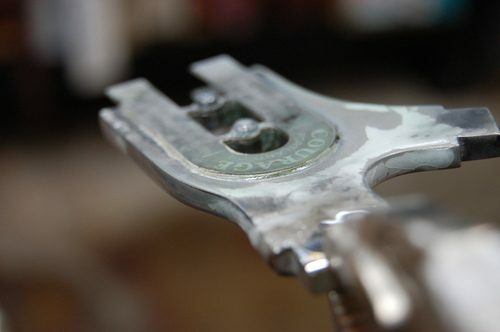 I pre-heat the part with the vice grip held in the vice, then hold it in my left hand when the silver starts to flow so I can make sure its evenly distributed. Sweating frees your hand from having to apply the filler rod. This minimizes clean-up later and reduces the amount of post-process polishing. These are really beautiful photographs showcasing Courage’s frame-building process. Be sure to check the rest of them out here. What is in Portland’s drinking water? These bikes are gorgeous.